As part of a talk at the ITWeb Security Summit last week, we discussed how to trigger email alerts when file signatures are validated with our Canarytokens project. Building on that alerting primitive, we can make signed executables that alert when run or signed Office documents that alert when opened. Canarytokens is our exploration of light-weight ways to detect when something bad has happened on the inside a network. (It’s not at all concerned with leaks in that dubious non-existing line referred to as “the perimeter” of a network.) We built an extensible server for receiving alerts from passive tokens that are left lying around. Tokens are our units of alerts. When a token URL link is fetched or a token DNS name is queried this triggers an alert via the Canarytokens server. With these (and other tokens) we set out to build alerts for more significant incidents. A security researcher, Alexey Tyurin, drew our attention to how opening signed Office documents can trigger token alerts. 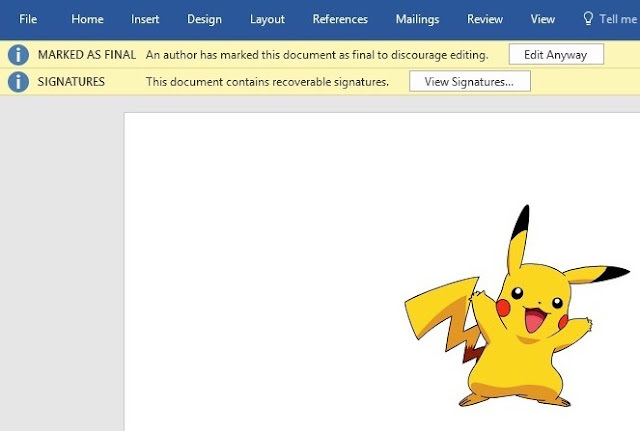 On opening a signed Word document, Office verifies the signature automatically with the certificate embedded in the document. A notable exception to this is when a document is opened with Protected View enabled (typically after the document is downloaded from the web or opened as an email attachment.) The signature verification in that case, happens only after the user clicks to disable protected view. During the verification, a URL from the certificate is fetched. We can set the retrieved URL to a token URL (which integrates with Canarytokens to fire an alert to set us off). The URL we set is in a field called Authority Information Access (AIA). This field tells the signature verifier where to fetch more information about the CA (such as intermediate CAs needed to verify the signing certificate). Signing Word documents gives us another way to alert when the document is opened. The previous technique, which is implemented on Canarytokens, uses a remote tracking image embedded in the document. While the document signing is not currently integrated in Canarytokens, it can easily be automated. This requires creating a throwaway CA with token URLs to generate a tokened signing certificate and then signing a document. Thanks to Tyurin, creating the CA is a short script. Signing the document programmatically can be tricky to get right. We've automated this by offloading the signing to the Apache POI library in a Java program. It’s worth noting more closely how the token URL is hit: Office offloads the signature verification to the Microsoft CryptoAPI which is what hits the URL. (In our tests the User-Agent that hits the URL is Microsoft-CryptoAPI/6.1). We should be able to re-use this trick with other applications that offload the signature verification in this way. If signed documents could be used to trigger Canarytokens we wondered where else this could work. Microsoft’s Authenticode allows signing Windows PE files, such as executables and dlls. The executables signatures are verified on launch if the setting for it is enabled in the security policy. The name of the setting is a mouthful: “System settings: Use Certificate Rules on Windows Executables for Software Restriction Policies". Our initial tests of signed .NET DLLs were able to trigger alerts when loaded by custom executables even without the setting enabled. However, if Authenticode can alert us when Windows executables have been launched, we have a uniquely useful way of knowing when binaries had been executed, without any endpoint solutions installed. To deploy signed executables, all that is needed is to token executables that attackers routinely run such as ipconfig.exe, whoami.exe and net.exe to alert us to an attacker rummaging around where they shouldn’t be. Zane Lackey's highly recommended talk (and slides) on building defenses in reaction to real world attack patterns makes the case for how alerts like these can build solid attacker detection. The verification, just like in the Office document case, is offloaded for Microsoft CryptoApi to handle. Signing certificates for the executables are produced in the same way. However, the signing certificate must also have the Code Signing key usage attribute set. Creating signed binaries is made simple by Didier Stevens’ extensive work on Authenticode. This is integrated into Canarytokens to make signing a binary as simple as uploading a copy to sign, but is also available as a standalone tool from the source. To sign an executable on Canarytokens, you upload an executable to the site. The site will sign the binary with a tokened signing certificate. Simply replace the original executable with the tokened one and verify that signature verification for executables is enabled. An attacker who lands on the machine and runs the tokened executable, will trigger the signature verification which gets an alert email sent (via Canarytokens) to let you know that something bad has happened. Many of our other canary tokens are built on top of application-specific quirks. Adobe Reader, for example, has the peculiar behaviour of pre-flighting certain DNS requests on opening a PDF file. What the Office document and executable signings point to, is a more generic technique for alerting on signature (and certificate) validation. This a more notable alerting primitive and is likely more stable than application quirks given that URL-fetching extensions are enshrined in certificate standards. Although in this post we’ve used the technique in only two places, more may be lying in wait. Edited 2016-06-14: Thanks to Leandro in the comments and over email, this post has been updated with his observation that Office document signature verification won't happen automatically when the document opens Protected View.